With help from US Marines, Tacloban Airport is up and runing on a 24 hour basis and last night for the first time airplanes were able to land during the night and offload aid. We have seen an uptick in Aid along the side of the runway from USAID, the US Government and others–food aid, medical supplies. Problem is getting it from the airport to the communities. Even communities half a mile from the airport. So the items are piling up at the airport. Even at the airport they can’t get water — begging CNN for sis of water. Anderson talks about how in Japan after the Tsunami the government troops came in and did an organized search, block by block. It’s not happening in Tacloban. 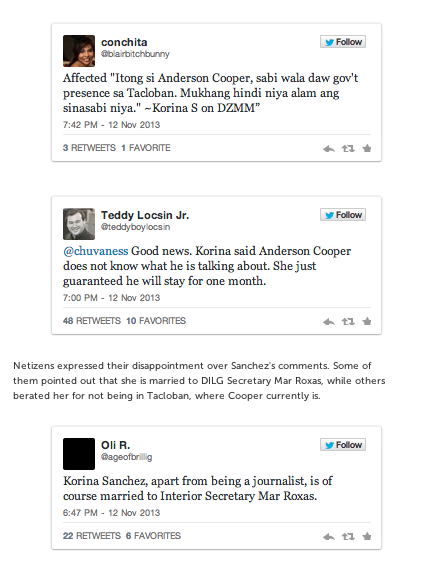 And then comes what people have been waiting for — Anderson’s dustup with Philippine News Anchor (and not insignificantly, wife of interior minister Mar Roxas), over a tweet that went out under Anderson’s byline. Cooper clarified on the air that the tweets in question were not his personal tweets — (he has not tweeted since being in the Philippines) — but they were tweeted by his producers based on content in his shows. At particular issue was Cooper saying that he did not see any significant military presence or organized effort. 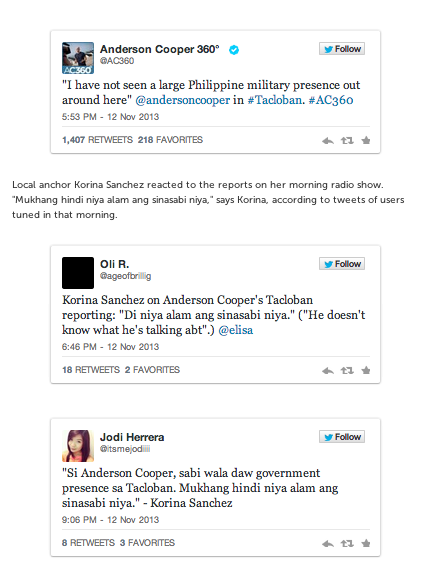 Philippine netizens reacted interestingly and it seems Round 1 probably went to Cooper. 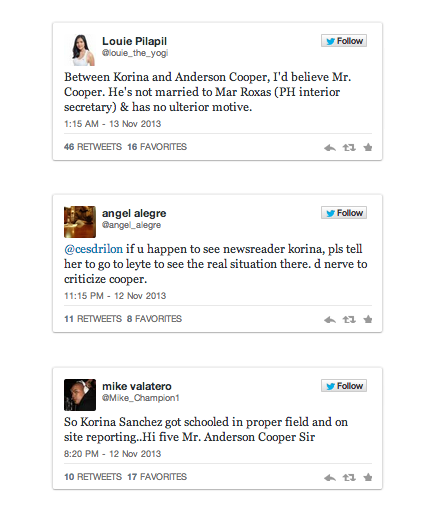 That being said, Cooper and Korina Sanchez shouldn’t be on opposite sides of this, and I basically hope this will go away (and now that I think about, the only reason to report it is to observe the internet reaction to it. MANILA, Philippines – As part of his coverage on Typhoon Yolanda (Haiyan) and its aftermath, CNN anchor Anderson Cooper reported on the difficulties and shortcomings of local relief efforts. 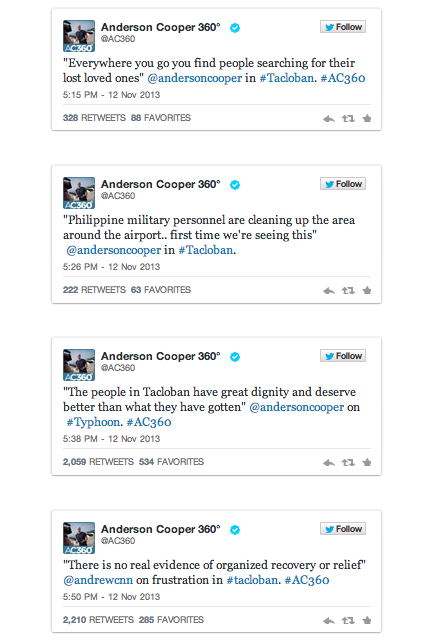 Cooper also tweeted his observations via the account @AC360 as he went around typhoon-ravaged Tacloban – from the lack of proper search-and-rescue missions, to paltry organization on the whole. Local anchor Korina Sanchez reacted negatively to Cooper’s reporting, and said over her DZMM radio program that Cooper didn’t know what he was talking about. Apart from being one of the country’s top anchors, Sanchez is also the wife of Mar Roxas, Department of the Interior and Local Government (DILG) Secretary. Roxas and DILG officials were in Tacloban, one of the areas hardest hit by the typhoon, to supervise government response. 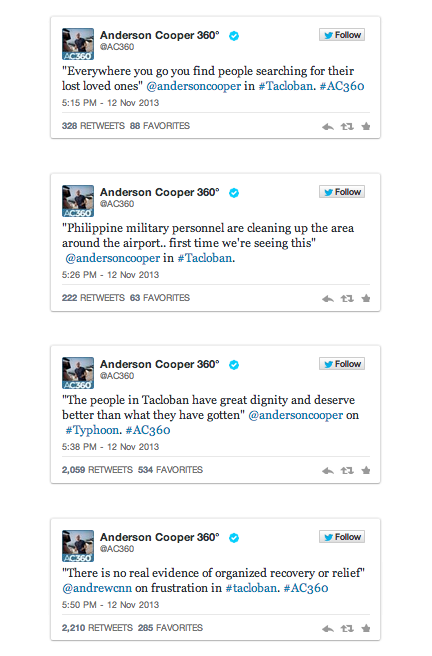 Below are Cooper’s tweets, as well as netizens’ takes on Sanchez’s reaction. Some of them criticized Sanchez, saying she was biased, while others pointed out that Cooper was more credible since he was reporting from the field. In contrast, Sanchez was dishing out commentary from the comforts of a studio. LOOKS LIKE YOU DON’T KNOW WHAT YOU’RE SAYING, CRANEHEADS! Why Madam Korina didn’t go there? It’s the network station’s assignment to her to anchor on her TV news show, and everyone else is assigned there! Only it’s a little bit of pity for her if she didn’t get there after the Haiyan aftermath to cover the situation there, but anyways her co-anchor, Ted Failon, who’s been there a day before the tragedy happens to tell her everything that happened in a particular location site, and it’s also her husband’s duty, Mar Roxas, as a Dept of Interior and Local Government secretary, to visit areas affected by the typhoon, know the situation there and take care of everyting from relief goods to services and rehabilitation! On the other hand, did Anderson Cooper did beg some help from his co-anchors and co-reporters about the situation here? I hope so that they did it! Of course korina will not go to Tacloban, she does not want to get her feet dirty and no comfy place or studio for her over in Tacloban. 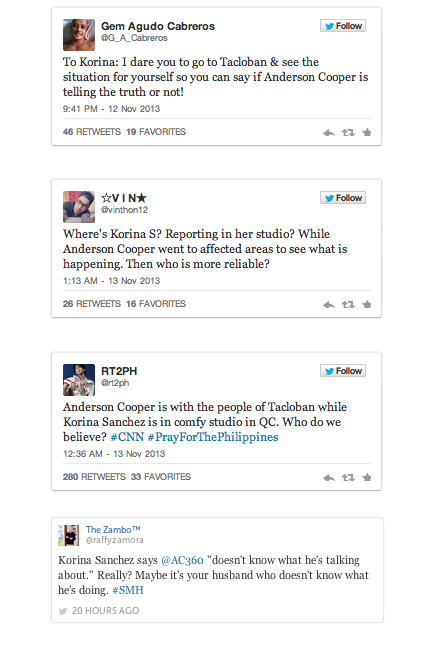 Korina you should be helping those victims from yolanda and not attacked to those people who tried to help! Shame on you! Our Hometown of Lawaan, Eastern Samar — Where, exactly, is it?